Homepage. This page: Part 3 from a set of pre-war motorcar repair magazines, published by Newnes in 1933. Most of the early motoring magazines featured here at oldclassiccar are the typical weekly or monthly affairs, with news, reviews and roadtests, interspersed with various old motor-related advertisements. 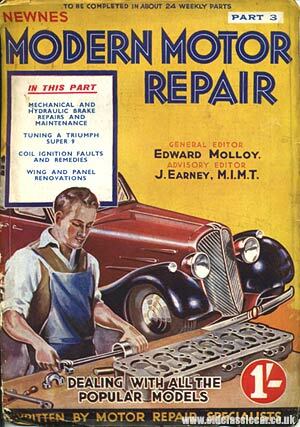 This magazine though, Modern Motor Repair published by Newnes in 1933, is different, in that the reader would collect each monthly issue, thus building up a set of reference material to help with the maintenance of his or her automobile. Interestingly, Newnes published a similar series of magazines a few years earlier. Titled "Motor Repair & Overhauling", information on that particular title can be found here. The copy featured here is Part 3, with the reader advised that the set should ".. be completed in about 24 weekly parts". The cover of each issue shows a diligent young chap in his overalls, dismantling the six cylinder sidevalve engine of his motor-car on the workbench. In this issue, the reader would learn about how to repair and maintain both mechanical, and hydraulic, braking systems, pick up tips on how to tune a Triumph Super 9, diagnose problems with coil ignitions, and also learn how to panelbeat battered old car bodywork into a semblance of respectability. Each issue of Newnes Modern Motor Repair magazine would cost the princely sum of 1'-, ie 1 shilling, or 5p in modern money. up the sleeves and head out to the motor house to commence disassembly. The first article looks at modern car braking systems, with discussions on how to equalise the each set of shoes around the car, to ensure that the car points in the correct direction under braking. Tips are also given on how to remove worn linings from the backing shoes, and then re-rivet new linings in their place. If ready-cut linings are not available from the local motor parts emporium, advice is given on how to cut one's own brake lining from a length of suitable lining material, using a hacksaw to cut it down to size. Nowadays any such instructions would be littered with dire warnings about the dangers of asbestos dust found in older linings, but back then these dangers were not appreciated and as such didn't get a mention. Next the lining material would need bending to suit the shoe, a gentle and even application of heat would allow the lining to be curved as necessary, retaining the curve after cooling back down. When riveting the linings, the magazine recommends starting from one end, and working along to the other end, whereas advice I've heard is start from the centre, and work outwards. Further articles on brakes, and specific information on certain brake installations, is also given, allowing the handy home mechanic to tackle any braking issues he may chance upon. Next is an article by G. A. Ashwell on the operation and fault diagnosis of coil ignition systems, at a time when manufacturers were starting to adopt coil ignition over the early magneto variety. A description of the principles of coil ignition is given, as are details of how the condenser functions, accompanied by various useful diagrams showing how the components are wired up in a typical motor-car. H. J. Butler contributes the next article in April 1933's issue of Modern Motor Repair, concerning itself with the convoluted delights of wing and panel repair work. Firstly a list is given of the tools that any aspiring body man should have in his workshop - including straightening levers, hammers, dolly blocks, spoons and paddles. A wooden mallet is also a recommended purchase, allowing the repairer to effect initial straightening attempts to the panel, without actually stretching the metal being worked on. 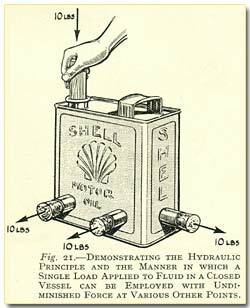 A screw jack is another useful bit of kit to have around, enabling the repairer to push out certain dents, for instance in the back panel, as shown in one of the diagrams. The second diagram shown above, demonstrates the use of a tool called the G.E. Denterazer, designed to 'erase' dents by all accounts using a variety of rollers that can be fitted to the master frame tool. The rollers are used across the damaged panel, above and below, in a diagonal zig-zag pattern, gently rolling out the dent from both sides. If planning a repair, it was worth waiting til May's issue (Part 4) as that issue looked into re-finishing techniques for the paintwork, once all repairs had been made. The final section of this month's issue concerned itself with tuning and maintaining the Triumph Nine, a small car fitted with a Coventry Climax engine. Although these old magazines date to the 1930s, used in conjunction with factory issued handbooks and manuals, they can still prove to be very useful indeed, especially where workarounds have to be devised when special factory tools are no longer available. In later years, aftermarket manuals such as those produced by Haynes and Clymer (in the US) would often replace publications such as Modern Motor Repair on the bookshelves, condensing all the information for a particular car into one publication, rather than spreading it over a number of separate issues over a period of months. If however, you wished to gen up on both cars and motorcycles, perhaps a fortnightly magazine such as Cars & Motor-Cycles from the 1920s would have been of more use. Another series from the 1930s, that looked at both motoring and also advice on touring around the UK, was The New Motoring Encyclopedia. Anyone involved with the commercial repair and servicing aspect of motoring, may well have opted instead for weekly copies of The Garage Workers' Handbooks, also published in 1933.